Yes, I know I peed on a stick and it showed a clear purple line. Yes, I know I’ve had several ultrasounds and have seen the baby boy growing rapidly inside me. Yes, I know I’ve felt kicks, punches and somersaults as Peanut charges about inside me. 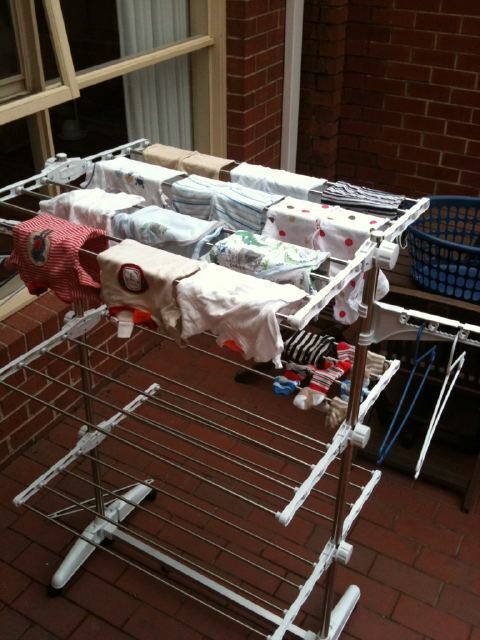 But what brought it home to me that in a few short months, we’ll be bringing a baby home was running my first load of baby clothes through the washing machine last night and hanging them up. The order I placed last week online arrived yesterday. While I am getting excited over the clothes, my husband is getting excited about seeing my belly growing and changing. I love that he loves it, that he grins at me when I waddle round the house in my undies because I’ve left something outside the bedroom, that when he kisses me hello or goodbye, he puts his hands on my belly at the same time.